I hardly use mine because for reasons I haven’t yet deduced the Q and A slugs stop short of the platen unless I whack ’em like a carnival game. 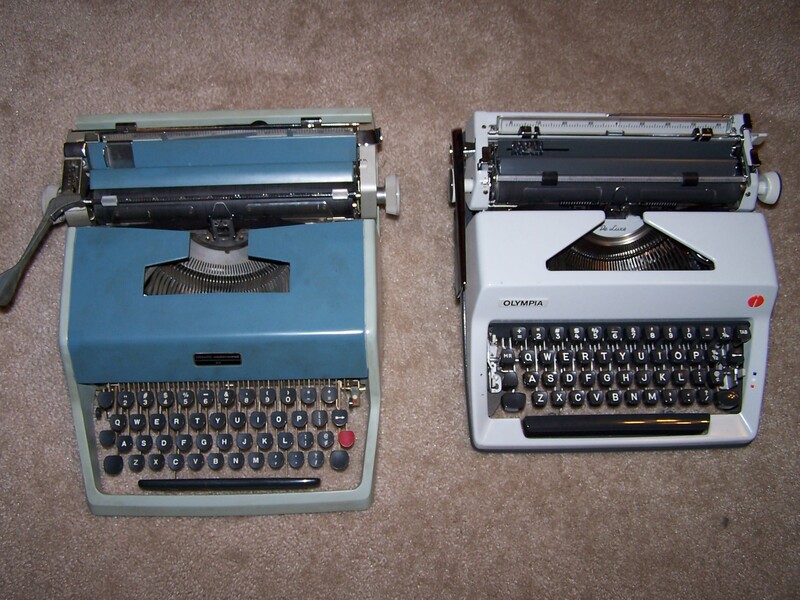 (I have another Olivetti on which the two keys at each end tend to stick; maybe it’s an Olivetti thing.) But other than than, it’s a nice, precision machine. The touch is a little funny in a way I can’t quite explain. It requires a different rhythm. My sensory experience of using one can be compared with the SM9. Both make me feel like a Serious Writer when I lay hands upon them. I’ve got the prior incarnation of this, a Studio 44 named Zsa Zsa. (http://www.flickr.com/photos/mpclemens/2555870419/) Like Alan, I find the action… interesting, although I tend to forget that it’s really smooth and responsive, and I find myself enjoying it whenever I bring it out for some air. It’s a favorite. I have the same machine and love it the more I use it. That bit of extra space is helpful (big hands). I think of the touch as deliberate compared to the snappy, rapid feel of the Olympia SM models. Olympias seem to almost anticipate the keystroke. If you can service it yourself, fine, but I think it is worth professional help if needed. You will have a typer for decades to come. Mine was in storage for over thirty years and all it needed was a new ribbon. It is now in the second tier of my favorite portables along with the mid-50s SC Super. The Olympias are my favorite portables. 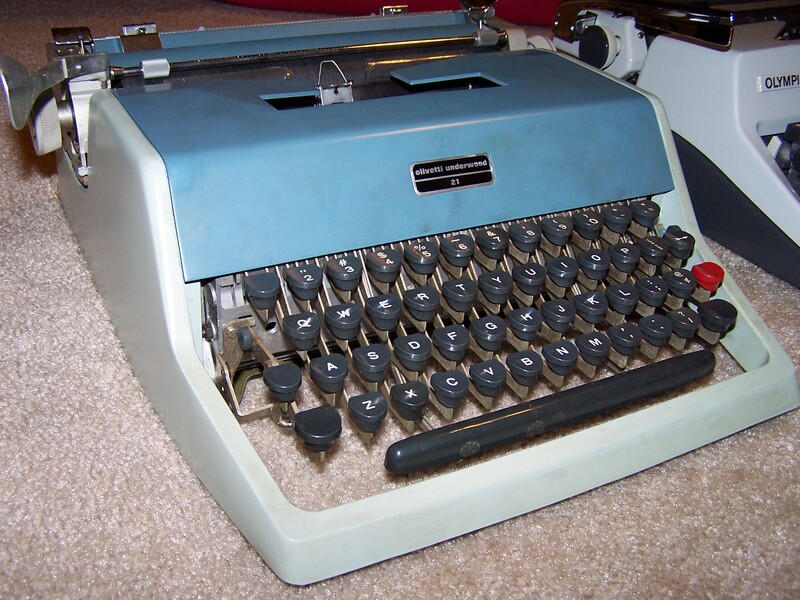 Of course the desktop machines, a 1950 Underwood and an Olympia SG1, are in their own category. I found one of these bad boys at a thrift store a few months ago. I used it some, put in on the shelf, used it a little more, shelved it, and now I’ve been using it again. I’ve never used a machine that feels quite like the 21. The action feels sluggish at first but it is very smooth and it feels good even after typing a longer piece. I’ve been using an Olympia SM-3 for a long time but I’m kind of on a kick of the Olivetti right now. I just picked up the same one at a yard sale this last weekend for a dollar. Now I just need to find some new ribbon and I’m in business. I just came across one but I think the carriage control lever is broken. The lever just moves back and forth and does not advance the roller. Also, dumb question: where the heck is the number 1 and where do I find the “!”? I don’t have the machine in front of me, but for the number “1”, you use the lowercase L key. A lot of portables have that feature. When I get home, I’ll see about the “!” for you. For the exclamation point, you may have to use a combination of an apostrophe and a period, backspacing to insert the second character.